Have you ever found yourself wondering, "What is risotto?" This creamy traditional Italian rice dish is a versatile food that can be used as a main course or as a side dish to jazz up any meal. It can be made with so many different ingredients that the flavors are never the same twice. Risotto comes from northern Italy; it is common in Piedmont and other northern Italian regions where short grain rice paddies are abundant. In traditional Italian meals, risotto is served as a first course. In American cuisine, risotto can be a first course, side dish or main course. Risotto isn't a single dish; it is a class of rice dishes made by cooking short grain rice slowly in broth. While ingredients vary, there is a very specific method used to make risotto. The best risotto rices are high in starch and low in amylose, a sticky glucose polymer. Rice that is too sticky or not starchy enough won't yield risotto's characteristic creamy texture, which comes from the starches in the rice. The best risotto rices are medium or short grain round rices. In the United States, rice packaged as "risotto rice" is almost exclusively Aborio rice; in Italy, traditional risotto rices include Carnaroli and Vialone Nano rices, as well as Aborio rice. 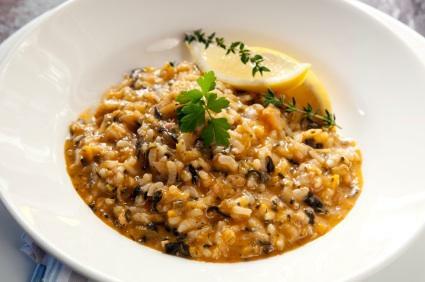 There are only six basic ingredients in traditional risotto: fat such as olive oil or butter, mirepoix, which is a dice of carrots, celery and onions, rice, hot stock and Parmigiano-Reggiano cheese. From these basic ingredients, it's easy to branch out by varying the type of stock used, adding in additional vegetables, herbs and meat and changing the cheese you use. Risotto is always made the same way. Sauté mirepoix in oil until it softens and begins to brown. Add the grains of rice and sauté briefly with the vegetables to toast the rice. Add hot stock a ladleful at a time. Stir the rice frequently and allow it to completely absorb one ladleful of stock before adding another. It usually takes about 20 to 25 minutes of slowly adding hot stock until the dish has reached an el dente texture. Stir in the parmesan cheese once the rice is el dente. This slow, careful cooking process allows the starches to come out of the rice, creating risotto's characteristic creamy texture. What is risotto without all kinds of add ins to make it suit your tastes? There are many ways that you can vary risotto to make it lighter or heartier; there are no rules, so your limit is your creativity. Here are a few risotto variations to try, along with their perfect wine pairings. Make pancetta and pea risotto by replacing the oil in the first step with chopped pancetta. Allow the pancetta, which is an uncured Italian bacon, to render its fat. Proceed with the traditional method, using the pancetta and fat to sauté the mirepoix and rice. Add in fresh peas and chopped fresh basil after the parmesan. Pair this risotto with a crisp white wine like Pinot Grigio. Make wild mushroom risotto using reconstituted dried porcini mushrooms and your favorite fresh mushrooms. Make the risotto according to the traditional method, adding the mushrooms into the rice and mirepoix in step one for a quick sauté. Replace part of the hot stock with the liquid from reconstituting the mushrooms. Add a sprinkling of fresh thyme when you add the parmesan cheese in step four. If you'd like to make the risotto extra special, serve it with a drizzle of truffle oil or shaved truffles. This risotto pairs well with an earthy Oregon Pinot Noir. Make a light seafood risotto by using seafood stock and adding cooked shrimp or lobster and the zest of one lemon when you add the cheese in step four. This risotto pairs well with an oaky Chardonnay. Risotto is a relatively simple food. Once you've mastered the technique, it is easy to make a variety of delicious risotto dishes tailored to your specific tastes. With a little creativity, you can become a master risotto maker.